Are you ready? Let's dive in shall we? I actually have THREE prizes to give. So there will be THREE winners!! 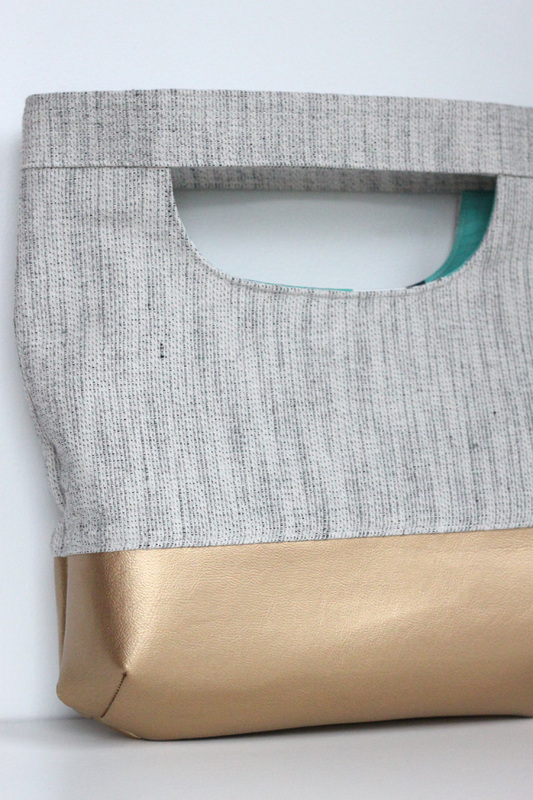 The first winner will receive some of my "Favorite Things" including a clutch I made just for the lucky person! 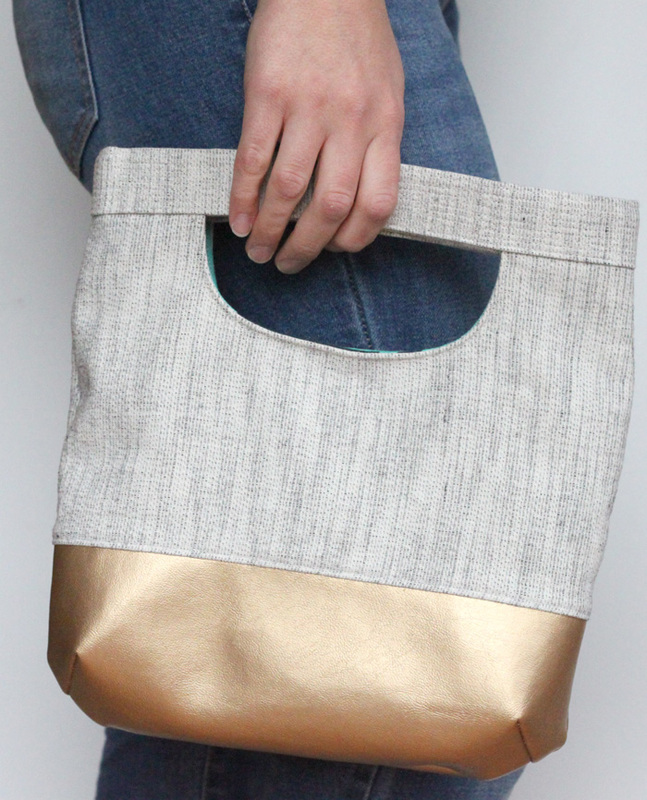 The second winner will receive a FIVE PACK of patterns, from some of my very favorite bloggers. 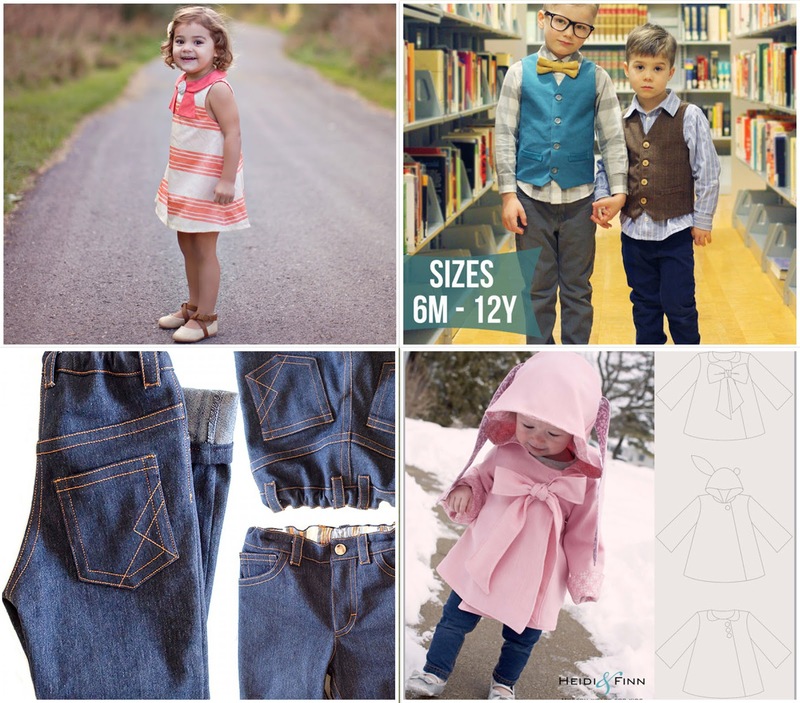 The third winner will receive a FOUR PACK of patterns from some more of my very favorite bloggers. Let's look a little closer at these amazing prizes!! 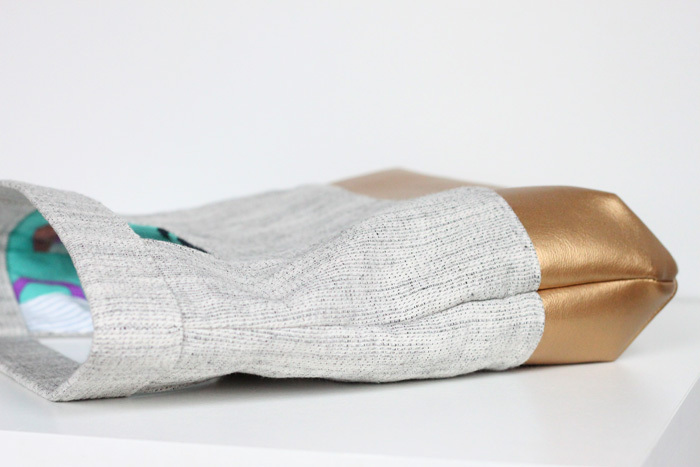 The first "parcel" includes this fabulous clutch I made using The Convertible Clutch pattern by Vanessa of LBG Studios. 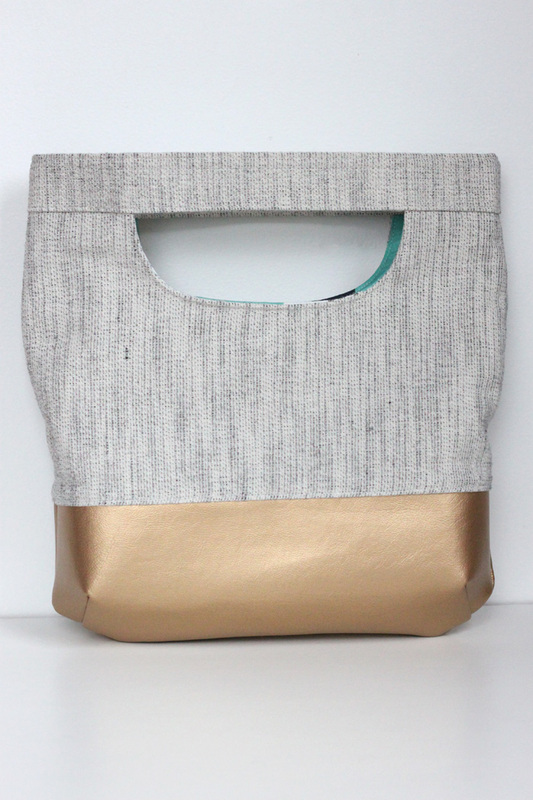 I "color-blocked" it with some awesome gold faux leather. 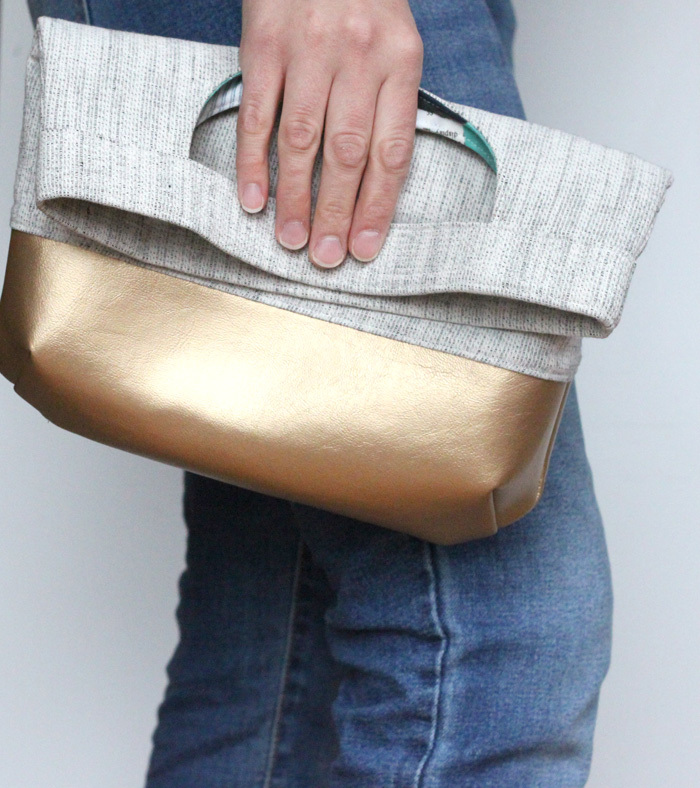 It also folds into a clutch, perfect for date nights. An idea of the size. Seriously, it's perfect! 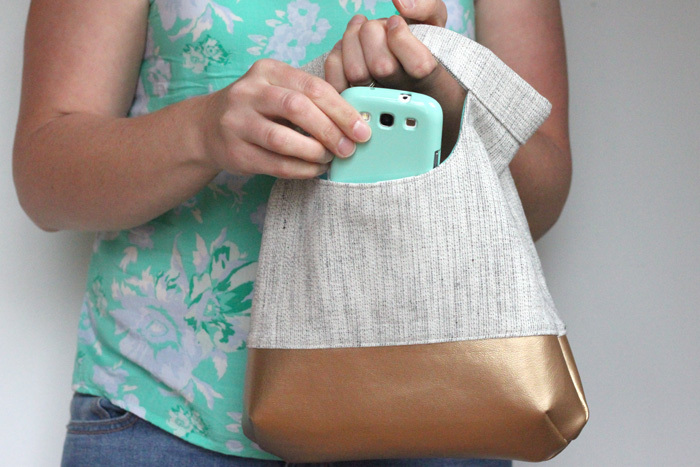 It even has a handy pocket on the inside for your phone! Or, whatever. A close up. I'm so totally in love with this! 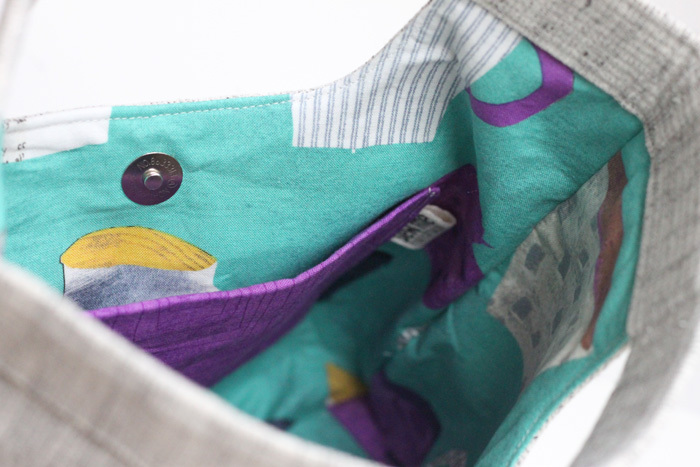 The inside is lined with quilting cotton in a fun coffee cup print. And now for the goodies that will be INSIDE the bag when it arrives at the lucky winner's door! 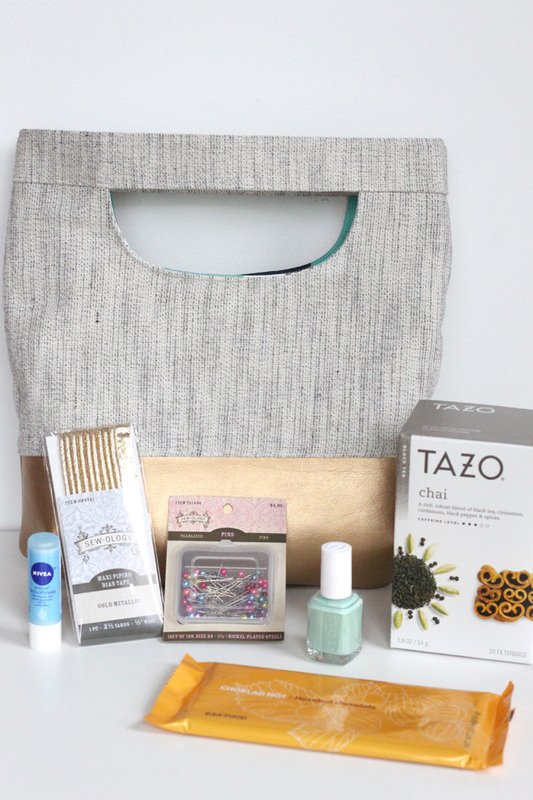 A few of my favorite things... Nivea lip balm, a pack of the most awesomest ever gold piping, my favorite kind of pins, Essie nail polish (it's the best, and so is mint, I love some minty nails), Tazo Chai Tea (I just recently discovered this stuff and it is amazing. I like it with a splash of milk and a drizzle of honey, yummmm. ), and CHOCOLATE. Because a giveaway is made so much better with chocolate! Hazelnut, mmm. Apparently I like food. And now for these AMAZING patterns I am lucky enough to be able to include!! The Knight Hoodie. Guys, The Knight Hoodie. I'm almost speechless that I'm lucky enough to give this away! 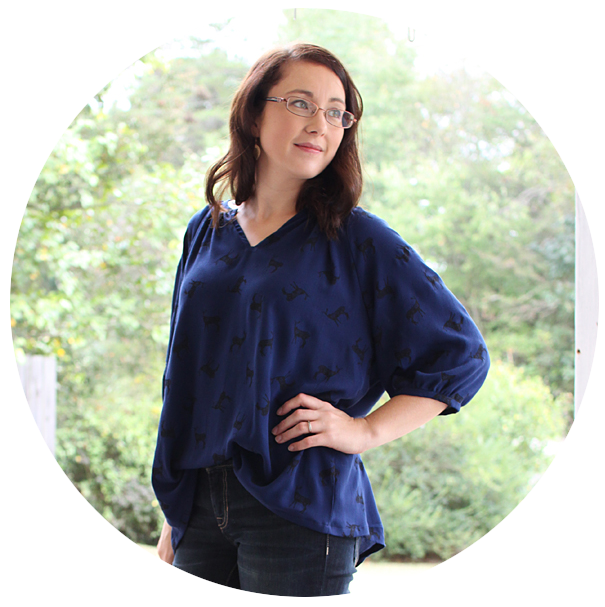 This pattern took blogland by storm and I can't WAIT to sew one up for Evan this fall! Debbie's Birthday Dress. 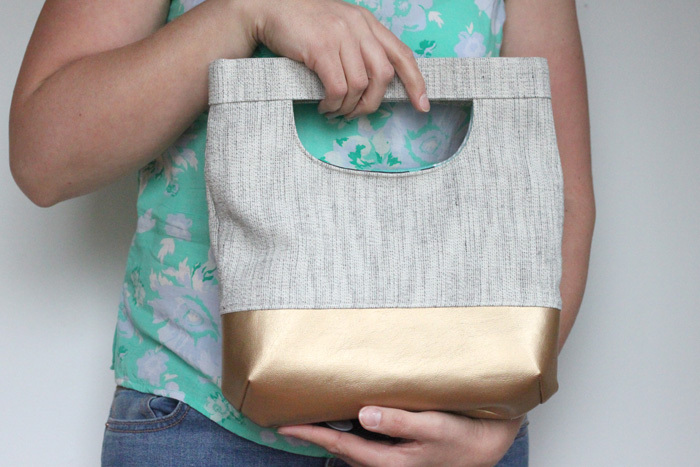 I sewed this for Olivia (see here) and am completely smitten with this pattern! She has worn and worn and worn that little corduroy number. Leather Accent Fold Over Pouch. I need to make myself at least 3 of these! And I can vouch for LBG patterns, I used an LBG pattern to make the pouch I talked about above. You will end up with a quality, well made product using her instructions. Small Fry Skinny Jeans. OMG!!! I have not had the chance to sew these up yet, but no joke, I have 5 pieces of fabric in my stash I bought specifically for this pattern! Now to carve out some time to make my kiddos some super awesome, LEGIT, JEANS!! Now for the fun part! Enter to win with the Rafflecopter below!! The giveaway is open until Sunday, April 13, 12:00am EST. Open to US citizens only. Sorry, shipping gets too expensive :/. Ice cream, caramel, outings with friends, ice cream, playgrounds, ice cream, sewing... have I mentioned ice cream? :D I love coffee shop sitting too! Combine that with a trip to the bookstore and it's the perfect date! Love that bag, it would be tough to give away. Crazy, the things in the bag are some of my favorite things. I have a stockpile of that gold piping and chai. Some other current random fav things - blue ball jars, tulips, cat print fabric, Izzy top pattern, and coffee. Happy anniversary!! It is a little :) My sister already requested one for her birthday, so I guess I'll just have to make 2 next time! Good tastes! I NEED to try that Izzy pattern! Some of my favorite things are the friends I've made in this community. Love my Teenies!!! Family, friends, and boy oh boy, chocolate! And all of these patterns and I love the clutch you made. Such an awesome combination of feminine and structured. I don't know how one would live without chocolate ;) And thank you! pins!!!! oh my goodness they are so under rated! Othere than that I love my family and gummy bears and talky tv shows like gilmore girls or pushing daisies. Yay!! A fellow pin lover! :) Yum. I love gummy candy. I love patterns. I have a tendency to hoard them. And I love bias tapes. No particular reason, they are just fun. I love patterns too. I think that I have way more time to sew than I do when I start looking at them :) Bias tapes are awesome. Especially ones that you make yourself! The Saffron twirl dress is definitely one of my favorite patterns! 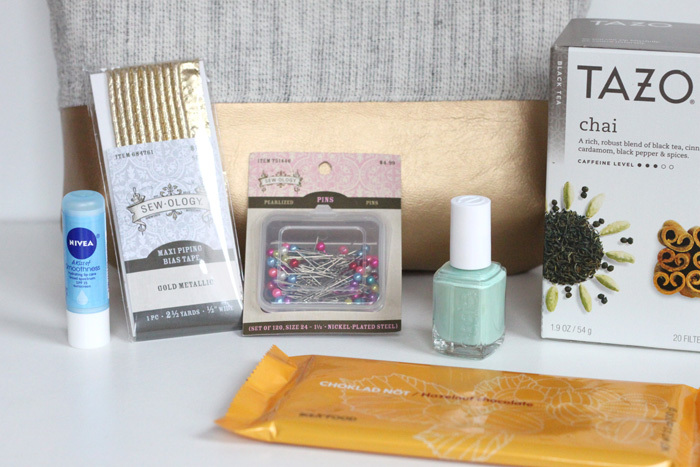 Great choice =) I also love chocolate, glitter, all things retro and a great red lipstick. Diet Coke, Disney World, sisters, and sewing of course! Chocolate. Seriously. 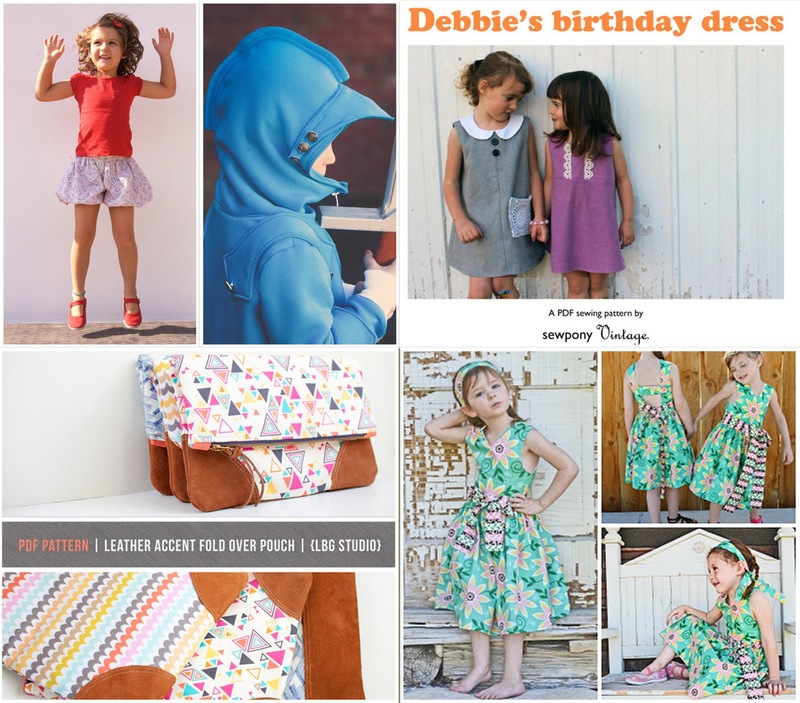 Fabric, ice cream, my kids, and sunny days!! Finally! A few of my favorite things :) - A good book, Spring, that clutch! and peppermint tea. Congrats on your anniversary! What amazing prizes! my favorite things are: to create paper flowers and fabric, creating hair accessories and spend my free time relaxing with my family and my friends! Baby hands!! The best. It all sounds amazing. I'll have to try the apples in tomato soup... ?? Glad you discovered jersey needles! They are awesome!